Grain Moisture Meter Model KM 963-G incorporates the latest technology for determining the moisture in grains. 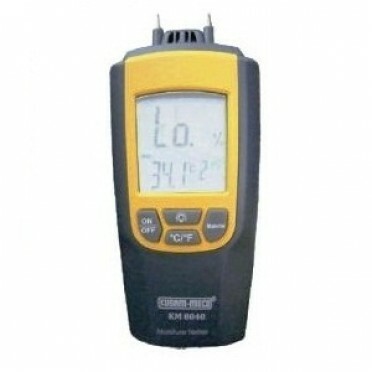 It complements the family of moisture meters for wood(KM 963) & Paper (KM-963P). It can determine the % moisture in Wheat, Paddy, Rice & Corn. The Instrument consists of sensor which senses the moisture in grains & a microprocessor computes the signal in % which is displayed on the LCD. It is very simple to operate. A white Backlight large LCD display ensures readings even in dark areas. When a series of measurements are made, it also indicates the MAX value. • Data Hold & Max Hold, Backlight Display, Low Battery Indicator. • The grain Category is represented with 1, 2, 3 & 4 on the screen. • Power : 5 X 1.5V AAA batteries.